Investing gets over-complicated all the time. Don’t be intimidated. It’s actually pretty simple. Download This Guide as an eBook! Subscribe and get the ebook version to save for later. Oh yeah, and I'll also send you 7 more free books to download. Compound interest. The 8th wonder of the world. Do you know the power of compound interest in its entirety? It’s the greatest thing in the world…when it’s working for you. When it’s working against you, it can be one of the most devastating things in the world. A catastrophe, really. I’m just going to take a minute or two to show you the amazing power of compound interest. Then I’ll let you decide if you would rather it work for you or against you. Compound interest may be more powerful than you think. If you don’t understand exactly how it works, it’s helpful to figure it out. And you came to the right place, because I’m about to explain how it works…both for you and against you. According to some recent polls, most Americans don’t actually understand how compound interest works. Many people think that if you have $100,000 and you get a 6% annual return, compounded over 30 years, you’re left with…$106,000. Not quite. It would actually be over half a million dollars. Crazy, right? That’s compound interest for you. Interest generally compounds annually, so that means you earn 6% on your principle. Keeping with the above example, the first year your principle is $100,000, but at the end of that year, you earn 6%. So that means the second year you’ll be earning 6% on $106,000. Making sense yet? Of course, this is an oversimplified example and it’s next to impossible to find a 6% return on your investment that stays at exactly 6% for 30 years, but it does make it a whole lot easier to explain. Got the idea? Investing – Just like in the above example, compound interest, over time, can lead to extraordinary results. You continue to earn interest on your money and it continues to grow as it compounds. That’s why a one-time contribution of $100,000 could easily grow to several times that over your life span. Early Debt Reduction – I’m about to explain how compound interest can be your worst enemy when you’re in debt, but you can actually take advantage of it with your debt too! By paying extra on your loans, early-on in the term, you will reduce your interest bill by a ton. In fact, with your mortgage, making a few extra payments in the beginning can knock years off the length of the loan. Don’t believe me? Read this. P = 5000. r = 5/100 = 0.05 (decimal). n = 12. t = 10. A = 5000 (1 + 0.05 / 12) ^ 12(10) = 8235.05. So, the investment balance after 10 years is $8,235.05. You may have seen some examples giving a formula of A = P ( 1+r ) ^ t . This simplified formula assumes that interest is compounded once per period, rather than multiple times per period. Just like compound interest works for you, it can work against you (which means it’s work for somebody else). When you’re investing, it’s nice to know that you’re interest compounds annually, when you’re in debt, it’s terrible to know that your interest compounds annually. This means that you pay your APR (Annual Percentage Rate) every year, based on the remaining balance. So if you owe $10,000 on your car and you have a 14% interest rate, you pay 14% of $10,000 the first year. After that you pay 14% of the remaining balance each year. Of course that amount is divided over your monthly payments. This is why, if you have ever looked at your mortgage annuitization schedule, you may have noticed that during the first few years, the majority of your payment is going to interest. That’s terrible if you’re paying your regular minimum payment, but if you pay extra, you can take a huge chunk out during the early years. Mortgage – The typical mortgage in the United States is 30 years! That means that even a low interest rate of 2% or 3% can be well over $100,000 paid in interest over a 30 year note. Consumer Debt – Credit cards and auto loans are the two most popular forms of consumer debt and two of the most likely to have a high interest rate. The higher the interest rate, the more each percentage matters. In other words, there is a bigger difference between 14% and 15% than there is between 2% and 3%. So those crazy-high interest rates could mean that you’re actually paying more in interest than you are in principle. I wrote an article about the “pay off your mortgage or invest the money?” debate and I actually proposed a compromise between the two, but the debate is real. Many people think it’s not worth your time to pay off your mortgage early since you can get a better return by investing the money. In other words, you can earn more by investing than you would save by paying off your mortgage early. Obviously this depends on both interest rates. So where is the line between paying off debt and investing the money? It’s definitely a blurry line. There’s no magic number, but when you can consistently earn more by investing than you save by paying off your debt, it’s at least worth considering. Just make sure you account for any taxes you may have to pay on capital gains if you’re investing in a taxable account. And here’s a general rule: when it comes to high-interest consumer debt, pay it off before you start investing heavily for retirement. Feel free to have your emergency fund in place and contribute enough to your employer’s retirement fund to get the match (if they offer a match), but other than that, the debt comes first. It simply doesn’t make sense to be earning 7% or 8%, while your paying 20% on your credit card’s revolving debt. The debt must go. Remember the power of compound interest and make sure it’s working for you, not against you. This guide will show you how to make it work for you. There are few topics that have as much written about them and as much contrasting information as investing. Just knowing that is enough to scare most people away from investing at all. Is it really that difficult? Do you really need to devote years of your life to studying the most efficient way to invest? It would seem that way, but in reality, not at all. The problem with most investing advice is that someone is profiting (or attempting to profit) from it. Investing is actually much easier to understand than you may think. Turn on any business TV show and you’re going to see all kinds of people touting hot stock picks and attempting to explain the method to their madness. I can assure you, it’s mostly just madness, with some greed on top. The vast majority of people in the world are terrible at picking stocks. You probably are too. I’m not that great at it. So should we just give up on the stock market? Absolutely not! It’s the most efficient way to invest for your retirement. But picking individual stocks isn’t the answer. Unless you’re willing to devote hours (I’m talking at least 15 or 20 each week) to studying companies and picking winning stocks. Did you hear that? Index funds. Most people who devote much of their time to picking stocks don’t beat the index. Why buy individual companies when you can buy the whole market? Or at least most of it. It’s easy for a beginner investor to start picking stocks and see a few gains. Then they think they must be good at this. I know I did. Until I realized that my small gains were nowhere close to the massive gains of the market since we were in a very bull market at the time. You must always compare your earnings to the index. The index is the standard. And to consider yourself a good stock picker, you’ve got to beat the index consistently. There are some important things to know about investing, but once you know these rules and understand them, you are in the clear. Invest in index funds. I know I sound like a broken record, but the average investor should be investing in index funds. It takes a lot of time to research individual stocks and spending all that time doesn’t guarantee your success. Also, index funds provide automatic diversification within the stock market and they save your time! Spend your time elsewhere. You’re better off devoting your time to earning more money, improving yourself and doing the things you love. Even if you could beat the index by a few points, is it really worth the time you spend? Avoid paying high fees. One of the best things about index funds is the low fees. You shouldn’t be paying more than 0.5% on a good index fund. And honestly, you shouldn’t even be paying that much. Avoid taxes as much as possible. You’ll be avoiding high fees, but don’t let Uncle Sam take it either. Find the best ways to shelter your money, legally, from paying taxes. Your company’s 401k and/or an IRA is your best bet. Follow Buffet’s first rule. Buffett says the first rule is to not lose money. Why? Probably because a 50% decline fully offsets a 100% gain. Index funds are pretty well protected. Take more risks when you’re young, but don’t be stupid. Time, not timing, is everything. Don’t try to time the market. You can’t. I can’t. Can George Soros? It’s debatable, but we are not George Soros and buying low and selling high never happens consistently. Save yourself the stress and buy low-cost index funds. Think long term growth. Yes and no. The idea is easy, but the discipline and practice isn’t. That’s why you set up an automatic investing plan. Not to mention it seems a lot funner to try to pick winning stocks, doesn’t it? It’s not. Earning a higher return over the long haul will lead to much more fun down the road. But you know that. That’s it. In less than 1,000 words, you know the most efficient way to invest for retirement. This isn’t the begin all, end all advice to investing, but it almost is. I know several dividend investors that do well investing in large cap individual dividend stocks. I also know owning Berkshire Hathaway isn’t a bad idea and I actually recommend it below. Invest in low-cost index funds, avoid high fees and shelter from taxes. You’re not going to hear that on TV. Keep reading to see how to start investing, and for more ideas. There’s no reason to figure everything out on your own. Plenty of people have went before us, made mistakes, and figured out what they did wrong. I have a friend who owns a farm in Missouri. Actually, he owns a whole bunch of farms. Thousands of acres. We will call him Gary. Because that’s his name. Gary has taught me so much about money. Some intentional, but some of most valuable lessons were things that he wasn’t actually trying to teach me. Gary grew up in Northern Missouri. He was used to the farm life and planned to own his own farm one day. Now he owns more farms than he would have imagined. He lives in a very nice home, right next to a nice pond for fishing. It’s a peaceful life and he wouldn’t have it any other way. In the 1980s, the value of land dropped to record low prices. It was devastating for many people who took out high-interest loans to buy million-dollar farms. Gary saw the value of land plummeting and viewed it as an opportunity. He started buying as much land as he could. He bought his first farm in his twenties. He could have been scared off by the worthlessness of the land, but he chose to view it as an opportunity instead. He was paying $200-$300 per acre for nice farmlands. You can add a zero to that for the price per acre today. Always be looking for opportunities and always be prepared to seize them. There could be ways for you to make money right now that you don’t even know about. Gary did some research and figured out about conservation programs for some of his unused land. Basically, the government pays him a certain amount of money per acre to not farm that part of his land. They only require that he mows it every few years. If he didn’t know about that, he would have been making thousands of dollars less than he has been making for many years now. He also learned that the government will stock your man-made ponds for free. What? Free food, fishing and fun provided by the government? That never happens. Apparently, it does. It was through research and learning that Gary was able to figure out about these options, and these are just a few of them. Always explore all your options for whatever you’re interested in. Farming works for him. He became a millionaire doing it. Figure out what your opportunity is and what your options are. 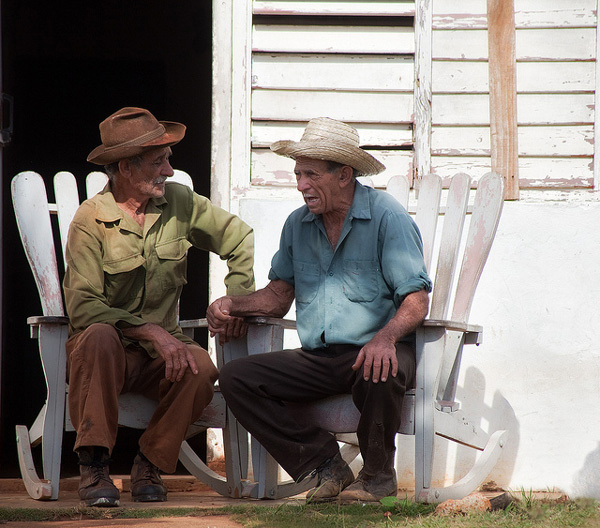 You may not have a desire to run a farm, but you can still learn a valuable lesson here. What opportunity will come in your lifetime? My guess is that you will have many. If you watch for them. Gary invested in undervalued land. Now he is a millionaire. Warren Buffett invested in undervalued companies. Now he is a billionaire. Figure out what works for you and look for opportunities accordingly. 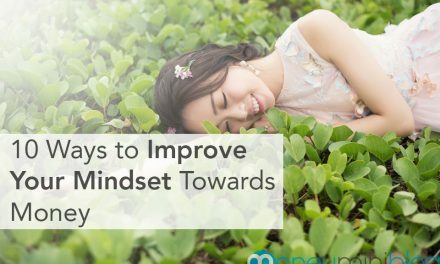 I have come to realize that if you keep the right mindset, success will follow you. It’s important to always be learning. Constantly. We can learn from everyone if we want to. Some people teach us what to do. Some people teach us what not to do. Take something away from every experience. Use it to learn and grow as a human being. Most importantly, never stop do that. In 1982, when Forbes began ranking the richest people in the world, the qualification to be listed was only $75 million. At that time, there were 13 billionaires on the list. Today there are over 1,400 billionaires around the world. From the stock market to businesses to commodities, they are all involved in some form of investing. Buffett is famous for being a “value investor”. He buys stock in undervalued companies and holds them for a long time…preferrably, forever. Successful investing is not a get-rich-quick scheme. Beware of hot stock tips, brand new company start-ups and shady investments that promise unusually high returns. The bottom line: Go for long-term, stable investments over short-term, isky investments. This type of thinking is common among successful people and successful investors. Your mistakes are usually a determining factor of your success. More success means more mistakes. The results are in. Successful people are good at failing. The bottom line: Don’t be afraid to make mistakes. Use them to learn and grow. Who are you taking financial advice from? Most people love to talk. They love to “give advice,” but is their money where their mouth is? Do they practice what they preach? And how’s that working out for them? Successful investing (success in general, really) is about taking action, not just talking about it. The bottom line: Only listen to successful people; people who do what they say. Wall Street is full of unsuccessful investors. Don’t get caught following the herd. The bottom line: Never make an investment, just because everyone else is doing it or just because someone told you to. Do your research and make wise investment choices. Casinos are a great place to have a lot of fun and lose a lot of money. You don’t need the stock market for that. Don’t get caught up in day trading before you know what’s going on. Your chances are better on the card tables. You should be investing in the business, not chasing high earnings from one day to the next. Furthermore, the price of a stock should be one of the least important factors in your decision when you are looking to buy into a company. The bottom line: Research the company. Invest in the company. Don’t worry about market hype and what the people on TV are saying. So, you’re interested in investing in the stock market. Perhaps, some individual stocks. I won’t stop you. I think it’s a blast, and I have several. But it is risky. Just know that. Of course, you can dramatically reduce the risk by being smart about it. And that’s what you’re doing right now. So let’s dive a little deeper into some terms and how stocks work. When you go to buy your first stock, you may be a little confused about the terms involved. Especially the stock market order types. These are simple terms once you understand them and they may be highly beneficial to your stock portfolio. The main terms you need to know initially are the terms for stock market order types. These are the basic ways you can order a stock. Most of the terms are fairly self-explanatory and a market order is the most simple. A market order means you purchase X amount of shares for whatever the current market price is at. That’s it! So far, so good, right? A limit is a way to protect yourself. You can set a sell limit order to sell your stock only at a certain price or higher. Or you can set a buy limit order to buy your stock only at a certain price or lower. Setting a limit is usually better than buying or selling at market value, because the market can change drastically and suddenly. You can set a limit for the day only or you set it as “good until canceled,” which usually expires after 30 days if the price wasn’t met. If your price wasn’t met, the purchase is cancelled. No harm, no foul. A stop order is an order that you can set to buy or sell a stock once it reaches a certain price that you specify. A stop order turns into a market order once the stop price is reached. A buy stock order is set at a price above the current market value and a sell stop order is set at a price below the current market value. This is a way to protect yourself against losing too much on a stock. As it sounds, this is a combination of a stop order and a limit order. Once the price of a stock reaches a specified price, it turns into a limit order. This way you can use a stop order, but control the price that you buy or sell at. Many traders use this type of order, as well as regular stop orders, for extremely high-risk stocks, such as penny stocks. 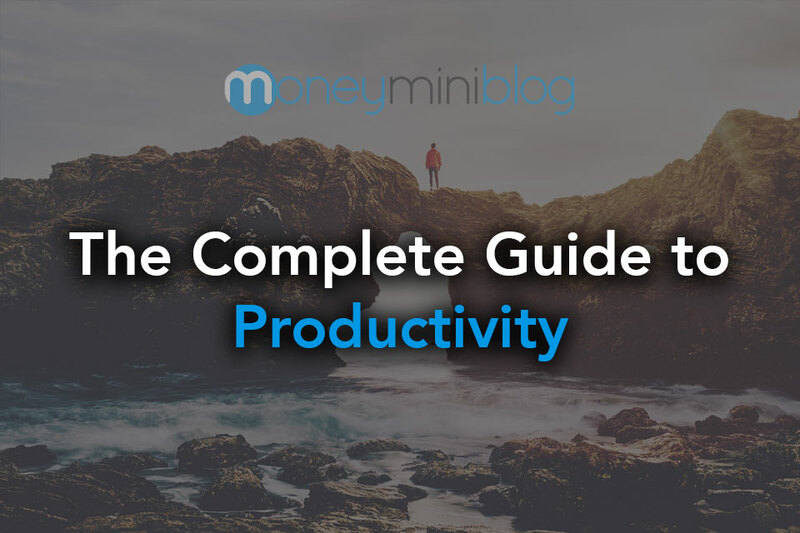 If you are planning on being a day-trader as opposed to an investor, then it may help you to do more research on stock order types, but for the investor who plans to hold their stocks for a very long time, you will not have as much use for these tools. Trading and especially day-trading can be a very risky and dangerous business, but if you choose to take that path, please do your research on all types of stock orders. What Causes the Price of a Stock to Rise or Fall? Have you ever consistently watched the price of a stock? You probably noticed that the price changed everyday. It may have went up one day, down the next and back up the following day. That’s typical for any stock. But what causes a stock price to change so often? So, why does a stock price change? The short answer is: nobody knows specifically. Stop it, you’re just making stuff up. “Stocks are down and no one knows why” is the only honest headline in this category. There are many reasons for a stock price to change, but there is no one person that can tell you exactly why a specific stock’s price changed on any given day. The most foundational aspect of the stock market (like any market) is supply and demand. See, like any market, even the mommy market. It’s like anything else, if there are more buyers than sellers, the prices rise. If there are more sellers than buyers, the prices fall. That explains the basic economic reason that a stock price would change, but that doesn’t really help you much, does it? Stock traders are different from investors. It’s not necessarily bad to be a stock trader, but it’s not really my idea of sound financial practice and 9 times out of 10 it’s about as safe as Vegas. They start young. Wait…what’s with all these babies? So, what do traders notice about stock prices? Stock traders attempt to track every single change. Popular stock advisers endorsing or denouncing a stock. Investors don’t really care about stock price changes. Investors are not affected by trivial news and an “earning miss” here or there. Warren Buffett definitely fits the investor profile, but where did all the babies go? The market fluctuates. All the time. It’s too stressful to worry about every movement. Investors don’t base their decisions on a stock price. We will never fully know the exact reason for a stock price change in any situation. A stock price alone doesn’t show you the value of a company. We don’t invest in a company’s stock price, we invest in the company. Whether you invest in individual stocks, index funds or mutual funds…you shouldn’t let stock prices alone affect your decisions. You can watch the market every single day if you want to, but don’t let the daily changes lead you to make changes in your portfolio. Hopefully this article gave you an insight into some things that can affect a stock price…basically everything can. More importantly, hopefully you understand why stock prices don’t matter. George Soros is more of a trader. One is not right and the other wrong. Buffett and Soros both have billions of dollars to prove that. The stock investor invests in the company, not the stock. Warren Buffett: Investor, billionaire, winner of the bushiest eyebrows award. Investors generally plan to hold the stock for a very long time, if not forever, through all of the market’s ups and downs. They can see that the company is growing and profiting and they, therefore, pay little attention to the actual price of the stock. The stock trader is much more concerned with the stock itself. George Soros: Trader, billionaire, winner of the longest nose-hair award. A recent fall in a stock price could mean quick gains if they buy while it’s low and hopefully sell high. A very risky form of trading is know specifically as day trading. Day traders have often lost more than they have earned in their life. It’s basically a gambling addiction. That isn’t to say that all trading is bad. George Soros is extremely good at it; however, I personally believe he is a mathematical and economic genius. So that probably helps him out a little. There are also several other types of trader, including position trader, swing trader and scalp trader. Without further ado, let’s figure it out…which one are you? This is not an exhaustive checklist by any means. This is not the begin all, end all of trading and investing. The important thing is that you use wisdom in your financial decisions. If you don’t know what you are doing, they can both be dangerous. Investors and traders are always happy when their stock price is up, the key difference comes in what you do when it goes down. Before you try to do either one, do your research. Your retirement will appreciate it. What makes a company a large cap or a small cap? What the heck is a “blue chip” stock? It’s important to know the difference if you’re interested in the Stock Market. There are ways to organize all sizes of companies into different titles, though it’s not an exact science. These titles are given for a reason. So that you can easily determine the size of different companies. A “cap” is simply a company’s market capitalization. It’s how you can determine the monetary size of a company. The larger the company, the larger the market capitalization (or market cap). Of course, values are always changing with inflation, but there are some actual amounts you can go by to figure out the size…at least for now, until inflation changes these definitions again. Micro caps are basically the smallest companies. There is a such thing as a nano cap stock, but the actual monetary size is up in the air. Nano caps are generally going to be your penny stocks. Many micro cap companies are as well. Generally a micro cap would be a company with a market capitalization of somewhere between $50M-$300M. Anything below $50M could be considered a nano cap. Being a step above micro caps, small caps generally start around $300M and continue into the $1B or $2B range. They aren’t huge, but they are somewhat established. Small cap stocks can be risky, but they can also generate some very high returns if you pick a great company that is growing quickly, while also having very solid financials…easier said than done, but possible! Now we’re getting into the $2B to $10B range. Mid cap stocks are generally safer than small caps (not always), but the return might not be quite as high since they have already been through their fair share of growth. There is a good chance that you have heard of a few mid cap companies, but they’re not quite as popular as large caps. Remember the term “blue chip” from the first paragraph? Here they are. Sometimes referred to as big cap, large cap companies are the largest companies out there. Anything over $10B. You may have heard the term “mega cap” before. Mega cap is simply a term used to describe the largest of the large cap companies, though the actual definition of mega cap hasn’t really been determined. Anything over $100B could reasonably be considered a mega cap company. Many large cap companies will be your higher yielding solid dividend stocks. These are considered your “safe” companies, but don’t ever fall for the “too big to fail” theory. Companies can always fail. Stocks can always lose value. Any company. Any stock. These terms are helpful, but the dollar amounts are, by no means, specific. Different investors and companies have their own views of what makes a company large or mid, etc. At least now, hopefully you have an idea as to what these terms mean. If nothing else, at least you know what a blue chip stock is. The Little Book That Beats the Market is a classic book on investing in the stock market. Author Joel Greenblatt gives an innovative method for choosing stocks. Here are his main ideas, and the “magical formula” he uses. He actually refers to it as “the magic formula,” and it just may be. I said this in chapter 1. Warren Buffett has said this before. So it’s nothing new. I’m not saying that Buffett and I are on the same playing field, I’m saying that I’ve said it before and an authority in the world of investing has said it before — two different perspectives indeed. Spend a lot of time finding individual stocks. Invest in index funds if you don’t have the time for option one. That pretty much sums it up. I mean, there are other options, but those are the two that make the most sense. Index funds have much lower fees than active mutual funds, and passive funds almost always beat active funds over the long haul, because around 80% of mutual fund managers don’t beat the market. The fact is, almost no mutual fund manager can beat the market, so why not invest in the market itself? That’s exactly what an index fund does. An index fund is investing in the market. Feel free to go read about it and see for yourself, but you’ll find it to be true. 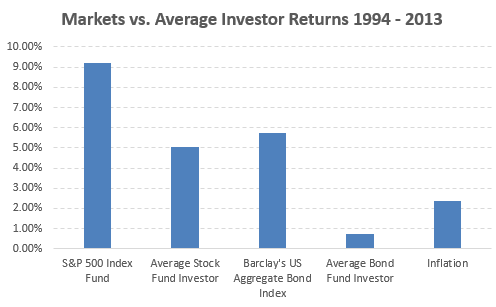 Index funds just make more sense than actively managed funds — over 80% of the time. So if you don’t want to put the time in to pick stocks (which takes a lot of time), invest in index funds. You can open an IRA with TD Ameritrade in less than 15 minutes and start investing in index funds right now. Greenblatt gives a formula for picking stocks that has continually outperformed the market, unlike mutual funds. Earnings Yield: A stock’s previous year’s earnings per share divided by the current share price. Return on Capital (ROC): The after-tax profit divided by the book value of invested capital. The earnings yield will be the factor that shows whether the stock is selling at a good price or not. So if a company’s previous earnings per share was $0.90, and the stock is trading at $20/share now, you would divide $0.90 by $20 and get 4.5 as the earnings yield. In this example, the earnings yield is pretty low, and the higher the better, so this one may not pass the test, but you get the idea of how to calculate it. The return on capital (ROC) is important, because it shows how well a company can turn investment into profit. The ROC is basically the profit percentage, so if someone invested $100,000, and earned $10,000, their ROC would be 10%. The idea is to buy stocks that have a high ROC, at a low price, and these two numbers above give you that information. These stocks are considered undervalued by Mr. Market. Greenblatt refers to the stock market as Mr. Market and he compares the market to an emotionally unstable person. The comparison makes a lot of sense, but don’t avoid investing just because the market reminds you of a crazy ex. The actual magic formula Greenblatt gives you is calculated using the numbers we discovered above. You start with a list of the largest 3,500 companies on the US stock exchanges (NYSE, NASDAQ, etc. ), and then you rank them in order of their returns. The company with the highest ROC is in the first position, and so on. Now take the list of companies and rank them 1-3,500 according to earnings yield, with the highest is position one. The companies’ scores are determined by adding these two ranks together, so if a company ranked 15 on the first list and 952 on the second list, the company’s score would then be 967 (15+952=967). The companies with the lowest total score are considered the best buys in this formula. Once you rank them, start buying. Greenblatt suggests that the more shares you buy, the better your chances of outperforming the market. 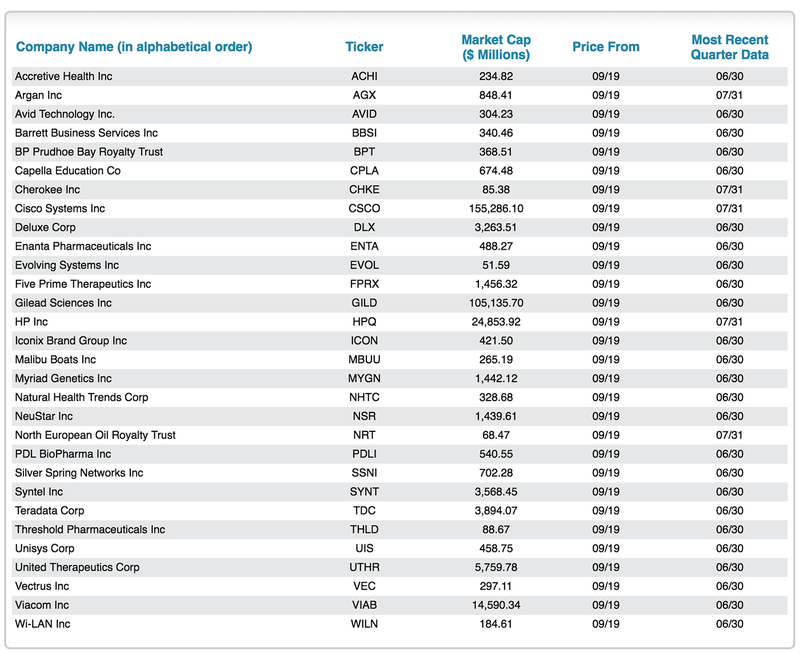 He recommends buying at least 20-30 large companies (the top 20-30 stocks on the list). He says this works better with larger companies, so if you want to play it safe, stick with companies that are worth at least $50 million. TD Ameritrade is also a great platform for buying individual stocks for your IRA. After one year, you sell the stocks and do the formula all over again. Sell the losses just before the one year mark, and sell the gains just after one year so that they become “long-term” holdings. Note: Don’t expect this formula to perform well every year. The reason professional money managers don’t use this formula is because they must constantly show returns, and this formula may go into the negative several years in a row, but over the long term (for retirement planning), this formula will beat the market and the money managers. The main ideas here are simple. One shows a way to invest easily if you don’t have the time to devote (index funds), and the other way shows a somewhat complicated method of manual investing that produces larger returns (The Magic Formula). There is a way to basically combine these two ideas, but it doesn’t involved index funds. It simply involves automating The Magic Formula. Greenblatt has created an amazing tool. A resource that streamlines the entire formula. The more stocks you own, the less risk. To get the overall, average performance of The Magic Formula, you need to own at least 20 stocks. Like I said earlier, the more, the better. Make an effort to review the stocks, even if you use the generator (which you should definitely use). You don’t want to own too many stocks in one sector, but with companies this large, it shouldn’t be hard to spread your picks out. This method will likely outperform the market by quite a bit, but it does involve more work. If you prefer to not to do the work, buy index funds. 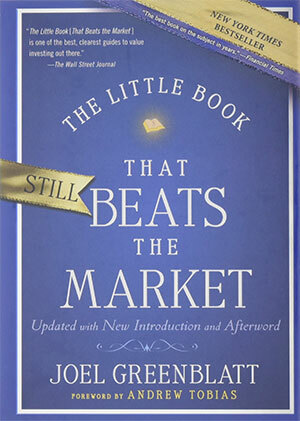 To read more about this investing method, read Greenblatt’s book: The Little Book That Still Beats the Market. But remember, investing in index funds is the easiest, least time-consuming way to invest. Beating the market is possible, but it takes work. Retirement is always an interesting topic. It may be so far in the future that you haven’t really thought about it, it could be closer than you care to admit, or you could technically be retired right now. It doesn’t matter how old or young you are. The fact is, you need to start thinking about retirement now. Today. You need to know your options. So I’m going to explain what they are and what to do. Work Retirement Plans – These are things like 401(k)s, 403(b)s and Thrift Savings Plans (TSPs), but it also covers things like pensions (if anyone actually still knows what that means). There was a day when almost all major companies offered pensions, which was basically the company saying “if you give us 20, 30, 40 or more years, we’ll give you a check for the rest of your life”. Yeah, that doesn’t really happen anymore in the US, with the exception of the military, but even that isn’t something I would count on. A Simple IRA is another type of company retirement plan, but only for smaller companies with less than 101 employees. Personal Retirement Plans – This would be your IRA, which is technically and legally known as an Individual Retirement Arrangement since it is simply a shelter to cover an arrangement of investments, not an actual account. 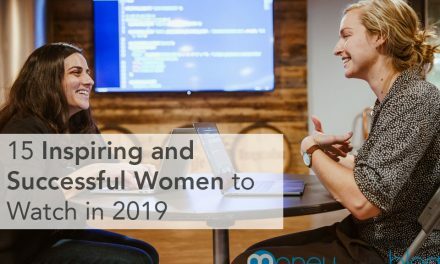 There are also SEP IRAs, which are IRAs that are fully funded by the employer, but most often used for self-employed people to fund their own retirement – that’s why they’re in this section. Unconventional Retirement Plans – This would cover anything that’s not a typical retirement account. One of the most popular unconventional retirement plans would be to sell your home (given that it’s very expensive) and downsize, using the cash you earn to live on. Of course, this would assume that your home would be paid off by the time you reach retirement. I’ve also known someone who built a subdivision and owner-financed all of the houses, using the mortgage income as retirement income. This type of retirement planning can be risky if it’s your only option. It’s always good to diversify, but especially if your retirement is of this nature. There are limits to each of these plans; contribution limits, as well as actual limits as to what you can do with them. There are also misconceptions about a lot of these accounts that I address later in this chapter. Start by contributing enough to your employer retirement plan to get the employer match. If your employer doesn’t offer a match or a retirement plan at all, obviously skip that step. Pay off all your debt, except your mortgage (if you have one). This will prepare you to fund your retirement. Fully fund your IRA. If married, fully fund both your and your spouses IRA, even if your spouse doesn’t have a job. If you max out your IRA (both if married), continue to contribute to your employer’s retirement plan. If your employer doesn’t offer a retirement plan, see if a SEP IRA works for you. If so, contribute to that. Once you’ve completed all of those steps, you’ll be looking good for retirement. If you still have more to contribute, consider opening a standard taxable account, opening/investing directly into a business or investing in some real estate. Either way, the goal is to diversify as much as possible. What about Traditional vs. Roth plans? Most plans offer both options. Even the TSP and 401(k)s offer a Roth version of the plan. To keep it simple, I suggest investing in a Roth if you qualify for it. If you earn too much to qualify for it, good job! But you’ll just have to go with the Traditional plan. What do you put in your retirement plan? I’ve explained the different types of plans, but what goes into them? Well, you have a few options. If you’re interested in some individual stocks, refer to the last part of chapter 3 or keep reading for some options. If you would rather stick with mutual funds, you should go with index funds (I explained why in chapter 1). For the specific index funds based on your age, check out the article, How to Choose Specific Index Funds for Retirement Based on Your Age, at the end of this chapter. You can open a retirement account with your employer (or ask if they offer one) by speaking with their finance department. You can open an IRA in less than 15 minutes at TD-Ameritrade. Let’s look at some numbers. You like numbers, right? Well…you probably do when they involve your money. We will use the fictitious charters: Pedro and Bob. Pedro understands that he needs to start contributing to his retirement at a young age, so he begins to put $100 into an IRA every month. Let’s just say he puts it all into index funds and he averages a measly 8% annual return on his money. Pedro is 20 years old and he contributes to this IRA until he is 50. Pedro will end up with $146,815.04. Probably not enough for Pedro to completely stop working, but he is only 50 now and this is assuming that he was never able to contribute more than $100 per month. Not bad, Pedro! Bob knows everything and in knowing everything, he realizes that he has plenty of time to think about retirement. Despite what Pedro tries to tell him, he waits until he is 35 to even start thinking about it. At the age of 38, Bob finally decides that he can’t work as the head-repairman of Chuck E Cheese’s for the rest of his life. He will need to start contributing to his retirement. At 38, Bob is starting to realize that he may be a bit behind the game, so he contributes $400 every month into an IRA. He had heard Pedro mention something about index funds, so he puts it all into those…whatever they are. Since he is using the same index funds as Pedro, we will give Bob the same assumption of an 8% interest rate. Bob contributes until he is 50 (like Pedro) and he will end up with less than $100,000 (98,377.42 to be exact). Well…what did we learn, class? First off, we learned that Bob should really be taking advice from Pedro. We also learned the compound interest that accumulates is much more powerful than contributing more money. Bob contributed 4 times the monthly amount that Pedro contributed! But since it was only invested for 12 years, he still ended up with much less money. Bob actually contributed more in 12 years than Pedro did in 30 years. Oh, the benefits of starting early. A little diversity here, a little security there. There are several components to a well-rounded retirement portfolio. You shouldn’t put all your eggs in one basket, but you don’t need a whole bunch of baskets. There are all kinds of ways to create a great portfolio, but you have to start with a solid foundation. Index funds anyone? Is the S&P 500 the first that comes to mind? I’ll start with my favorite. Index funds are indeed my favorite. Those are only a few of the things that index funds can provide. You should have a nice mix of domestic and foreign index funds. You can choose actively managed mutual funds if you really want to, but they aren’t necessary. You may even want to throw in some bond index funds. It doesn’t get much more solid than Coca-Cola, but it’s not exactly a health drink. If you want to throw some individual stocks in your portfolio, try some well established dividend stocks. Think Dow Jones companies. Go for fairly high-yielding dividend stocks, but a high dividend shouldn’t be all you look for. Look for companies with a strong brand and strong financials. It’s great to earn a dividend whether the stock price rises or falls. You can reinvest your dividends to keep buying more stock. Once you reach retirement, you can start receiving income through dividends. DivHut is a great blog completely dedicated to dividend investing. Who knew a stock shareholders meeting could be so exciting? Considering that Buffett made his money through investing, I think it’s safe to say that he knows what he is doing. He has created a portfolio of great long-term value stocks, as well as many really solid private companies. Think of it like a mutual fund that was created and managed by Buffett himself. If you didn’t know, I am talking about Berkshire Hathaway. This is the one stock that I would recommend to anyone. It’s Buffett’s holding company for investments and businesses. Class A Shares (BRK.A) will run you close to $200,000 each, but for us normal people, we can buy Class B shares (BRK.B) for under $200 each (at the writing of this article). With high capital, low debt and an annual growth of 19.7% to it’s shareholders for the last 48 years, it’s really a no-brainer. Your retirement portfolio may include more than these funds and stocks…and that’s fine. You can always invest in some income real estate. You can even buy physical commodities like gold and silver. The recommendations here are meant for your IRA. Diversity should include all kinds of investments, not just stocks and other paper assets (see chapter 6). This gives you a great idea on where to start and what you may want in your portfolio. It’s your portfolio, and only you can make the final call. 36% of Americans save absolutely nothing for retirement. 80% of people ages 30-54 believe they will not have enough money saved for retirement when the time comes. You know you need some sort of retirement plan, but can you afford it? Are you a statistic? Or on your way to becoming one? It doesn’t take much to get started and it takes even less to keep going. You can’t invest what you don’t have, so you will need something with a low minimum initial investment. Fees can be a killer. Especially when you’re dealing with small amounts, because fees often stay the same. Example: If an investment company has a $9 fee for each transaction, you will be spending a much higher percent on a small amount than you would with a larger amount. $9 is 9% of $100, while it’s less than 1% of $1,000. This means you may want to choose a different company or start with an investment that doesn’t require a transaction fee. The point is, you don’t want to spend 9% in fees if you are only earning 7% or 8% in interest. Always try to keep investing fees at 2% or less. You can generally start your retirement account for free. That’s right! Free! Not only is it free, but you have options! If your employer offers a retirement plan, you should look at that first, especially if they offer a match. There usually isn’t a minimum to get started. If your employer doesn’t offer a retirement plan, you can open an IRA. That explains the method you should use, now let’s move on to what you can invest in with just a few bucks. 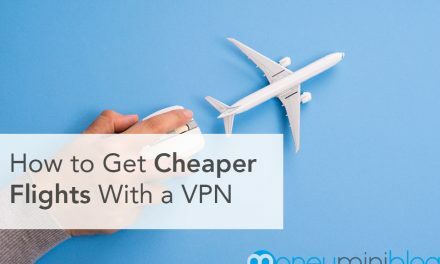 There are way more than three options to invest for under $100, but these are the easiest methods to implement right now…and by the way, there may be a fourth method here, because I couldn’t resist — I told you there were more than three! Starting with one of these “starter funds” is a great way to begin, but don’t stop there. Once you have enough to afford a better mutual fund, start upgrading! The fund you really want may have a $1,000 or a $3,000 minimum (especially if you’re looking at index funds), so just climb the ladder. Start with a $100 minimum fund, then go to a $500 fund when you get there, then $1,000, then $3,000. Work your way to the top. You’ve got the idea. Dividend Reinvestment Plans (DRIPs) are a great way to start small. A DRIP is a plan that allows you to start as small as buying one share of a company, then continueing to invest your dividends into buying more shares. It compounds over time. It’s a great way to start small and end up with a lot more than you may expect. More on DRIPs in chapter 7. More on ETFs in chapter 7. I know I said three ways to invest, so consider this a bonus. Betterment is a great way to invest and there is absolutely no minimum to start an account. Betterment is a website that allows you to invest in different ETFs based on the asset allocation you select. You don’t actually pick the specific ETFs, so that may be an issue for some who want to have more control over their investing. Go check out Betterment Here. These are only a few of the options you have for investing with a small amount. This all goes to show you that anyone can start investing for retirement. It doesn’t take much. Once you start contributing to your retirement, keep going! Even if you can only afford a few dollars every month, contribute something. You’ve heard how important it is to fund your own retirement. You’ve heard that Social Security won’t be there for you. You’ve heard that you need to be investing in some type of IRA, 401k or some other retirement account that must be an acronym and may include numbers. However, you may not realize some things about those retirement accounts. Truth: Contribution limits for your 401k, IRA, TSP, or whatever type of personal or employer retirement account you contribute to are for an individual, not a household. For example, in 2015 you can contribute up to $5,500 to your IRA. Your spouse can also contribute $5,500 into an IRA, for a grand total of $11,000 in contributions. Double the contributions, double the fun! You can always find the current contribution limits here. Truth: You can actually have multiple retirement accounts. You could have a few 401ks and 15 IRAs if you want, though I wouldn’t recommend doing that for the sake of keeping track. The only thing the IRS cares about is that you don’t exceed the contribution limit with the total of your contributions to all accounts. Truth: Retirement is only one thing your IRA is good for. You can also use it for education, medical expenses and even as a down-payment for your first home. That’s not all though! Here are even more uses for your IRA, other than retirement. Truth: It completely depends on your situation. I remember opening my first Roth IRA and wondering why anyone would choose a Traditional IRA (other than the income restrictions), but one is not always better than the other. It comes down to your tax bracket. Is it going to be more beneficial for you to be taxed now or later? That’s your call. Truth: Contributions to a standard retirement plan must be contributed from income; however, there is an exception to this. Non-working spouses can contribute to a spousal IRA, which allows single-income families to still contribute up to $11,000. Either way, somehow the money must be income – you can’t put just any old money into a retirement account. So what happens if you strike it big in Vegas and want to throw it into your retirement? Well first off, you would be one out of a million who would do that with your winnings, but if that actually does happen, just contribute all of your income and live off the lump sum you just won. Truth: As I mentioned above, you can use your IRA for several things other than retirement, but there is another way to withdrawal early (specifically out of a Roth) without a penalty – you can simply withdrawal only what you’ve contributed. With a Roth IRA, you can withdrawal your contributions at any time (tax and penalty free), but there’s a catch…you’ve got to prove how much you’ve contributed to the plan over the years. It’s best to wait until retirement to touch the money, but if you do plan on an early withdrawal, make sure to keep track of your actual contributions. Why Not Open an IRA? Your employer may or may not have a company retirement plan. Either way, it’s nice to have an IRA, whether it’s your only retirement plan or an additional one. I have both. I suggest TD Ameritrade since you can open an IRA with them in less than 15 minutes and get up to $600 for doing so. When you hear about investing for retirement, you usually hear about mutual funds. More specifically: index funds. Especially if you have been reading my articles. Index funds are widely held as one of the best investments for retirement. Especially if you want the easy way out. Even Warren Buffett recommends index funds for the average investor. That’s all good and well, but there are thousands of index funds, which ones should you invest in? This is going to be a very straight forward explanation. A cut and dry guide to index funds for retirement, straight ahead! That means that it won’t be all inclusive. This article is very generalized and because of that, some things may be left out. The goal is to give you a general idea of what you need to do. I am going to give you specific index funds, including links to view them. First, you need to determine your situation. The main factor is your age. You will need to determine you retirement goals depending on when you plan to retire and the quality of life you want to have once you do retire. I’ll give you specific index funds based on your age. Obviously this isn’t a “one size fits all” scenario, but it’s a great guideline. The words aggressive, moderate and conservative are self-explanatory. Index funds can range from extremely aggressive (high potential for gain and for loss) to extremely conservative (little to no potential for loss and not much potential for gain). If you can’t afford the minimum initial investment of the fund(s) you want, begin with a starter mutual fund that has a lower initial investment until you have enough to invest in the fund you want. You can include a variety from the lists given here. These aren’t the only index funds you should own, this is just a guideline. Put more into aggressive funds when you’re young. Put more into conservative funds when you’re older. That’s the main takeaway. There are also plenty of other companies that offer great funds. I just listed USAA and Vanguard, because they are well-established and…I just like their funds. As I said, this list doesn’t apply to everyone, but it can give you an idea of where you money should be. Different people have different goals and every situation is unique. This is as close to a step-by-step guide as it gets for the broad topic of retirement. One last note, just because a fund isn’t in your age-range, that doesn’t mean you shouldn’t buy it. This is for the “average” investor. For example, almost anyone would benefit from own a S&P 500 index fund. Subscribe to get 7 free books and a weekly update from me. You'll also get the latest resources and tools I find, and a weekly recommended book. All in one email per week. Automation is a word you should be familiar with. Automation has changed spending, saving and investing. It’s virtually taken the discipline out of it. It used to be that investing required discipline. Especially long-term investing. You can retire wealthy with little to no discipline. Sure, there is some discipline involved, just like there is some discipline involved in going to work everyday, but that’s not much at all. And it’s definitely not enough to make excuses for not investing. It only takes a few minutes to setup an automatic investing system that you can retire on. 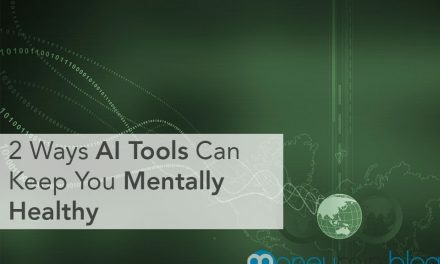 What kind of investing can be automated? All kinds. Practically your entire retirement. …to name a few. Learn more about these in chapter 7. So how do you set up all of this automatic stuff? You can automate your entire budget, which is especially nice if you hate budgets. 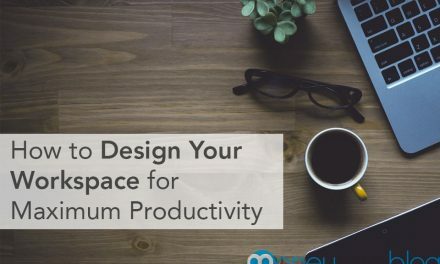 This will require you to set everything in place one time and then you can set back and know that you are living responsibly without using a typical budget. Of course, you will still want to monitor your finances, but they will be set. What’s left after all of that? Your spending. That’s it. Once you automate all of the things above, then you will know how much will be coming out of your account every month. That’s when you know how much money you have left for spending. If you are a visual person, I suggest pulling out all of your spending money in cash. That way you can see it dwindling down throughout the month. When you run out of cash, you stop spending. Not having money to spend makes it easy to not spend money, right? It’s one of the best ways, really. You can automate your entire retirement, and it may not even cost what you think. Small amounts add up. You’ll see in the next section. The Slight Edge is a book, but more importantly, it’s a concept. A very successful concept, I might add. The Slight Edge is the idea of making small changes and small progress over a long period of time, which leads to extraordinary results. And the best part is that these small changes can mean automating small amounts to go towards your retirement. Now, there’s more to it than that, but that’s the “nutshell” explanation. Have you ever tried to start a new habit? And have you ever not followed through with it? We all have. Would you be 50 pounds lighter? Would you have read 100 books? Would you be much closer to retirement? Now really think back. I’m talking years back. If you would have stuck with it, think about where you would be. OK, the guilt trip is officially over. That’s enough talk about what you didn’t do. Let’s talk about what you can still do. If you failed, it’s most likely because you started wrong. You probably started by doing too much, too soon. The Slight Edge is about small habits. Daily habits. 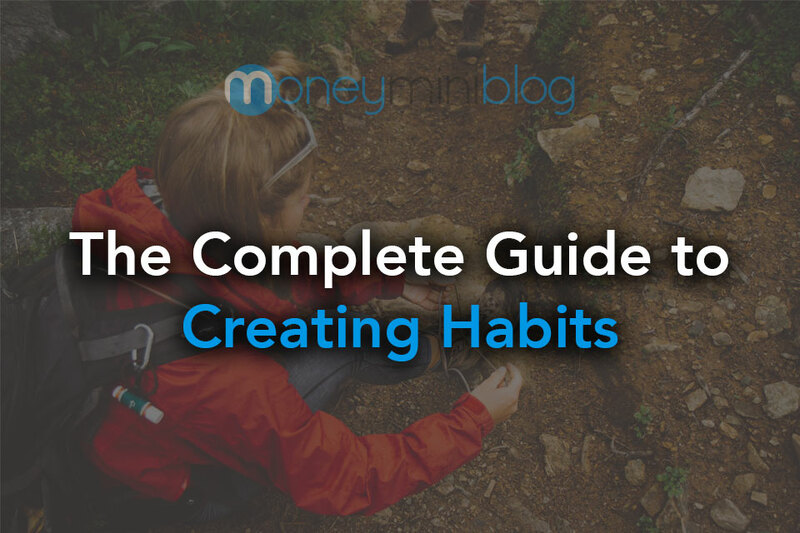 Habits that almost seem too small…but they add up. So, what exactly is the compound effect? It’s like compound interest. In the short term, it’s small. Over the long haul, it compounds like a snowball turning into an avalanche. Again, look back and think about where you would be with a habit now, if you started it this way a year ago. Or, more positively, think about where you will be in the future. Now we’re shifting from metaphorical to actual. I’m talking about cold hard cash. Actual compound interest. The most basic application of The Slight Edge is in your finances. You contribute a small amount, consistently, for a long time and you will be rich. I’m not going to use the typical “10% average return of the stock market”. I could make a great argument that 9% is actually realistic; but just to be conservative, let’s use a rounded 8%. 70 years may seem like a long time, because it is a long time. But when we’re talking about leaving a legacy (more specifically, an inheritance), 70 years is definitely a reasonable time-frame. Would it be possible for you to save more than $500/month? The answer is yes, but it depends on how much you’re willing to sacrifice (or how hard you’re willing to work). If The Slight Edge can do that for your finances, what do you think it can do for the rest of your life? You can implement this strategy for any goal. The thing is, you can accomplish anything if you start small enough and stay consistent. If you read for 15 minutes a day, every day, that equates to about 1,000,000 words in a year. Back to your finances. What if you were to read a good finance book for 15 minutes a day? 1,000,000 words about finances each year? Imagine where you could be in a year, or two or twenty! Better yet, what if you could read for 30 minutes a day? As cliche as it sounds, the possibilities are literally endless. Give yourself a slight edge over the rest (OK, I admit, that was corny). Seriously though, it doesn’t take much. Think big, smart small. If don’t have The Slight Edge, I would strongly recommend getting it. It’s just a few bucks on Amazon and the content is priceless. 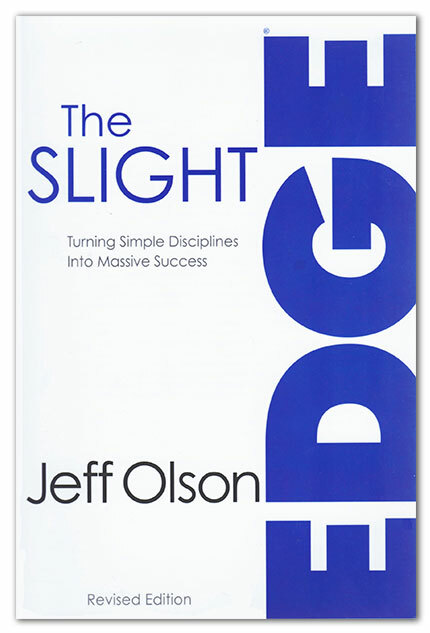 Click here to buy The Slight Edge on Amazon. If you have a retirement plan through your employer, see your finance department and figure out to have a specific amount of percentage deducted from each paycheck. For other options (mutual funds, index funds, IRAs, etc. ), go to TD Ameritrade or USAA and open an account. Both companies offer options for automatic investing. Once you automate your investment, check back in at least annually, and while you’re there, increase it by 1%. If you only increase by 1% a year, you won’t notice much of a difference, but it will make a huge difference to your bottom line in the end. Have you ever heard similar advice? I’m sure you have. And for good reason. The US dollar is economically weak, but politically and realistically strong — a weird combination, but it’s true. Before we get too far off into the debate over the US dollar (and I can go on all day; I am a finance nerd, remember ), let’s get to the important stuff here: investing without the stock market. That’s what this is about. I love the stock market, but I also love diversity, because I love investing and investing without diversity is illogical. There’s diversity, and then there’s diversity within diversity. Diversity means owning several types of investments. Diversity within diversity means owning several types of each investment. Owning stocks across several sectors, different types of bonds, and cash accounts is great diversity within the paper asset class, but that’s all it is. True diversity has to span asset classes. Warren Buffett has been one of the most famous, and long-running, advocates for the stock market. That’s where he made his money, and he recommends it as the easiest way for you to make money on your investments. But even Buffett has diversification outside of the New York Stock Exchange. Buffett’s famous letters to his Berkshire Hathaway shareholders have not only been valuable for learning how to pick stocks, but they’ve been valuable in making any investment decision. As you’ll see in a moment, many of these comments pertain to Buffett’s farm and the piece of commercial real estate he bought in New York. Whether we’re talking about a dividend stock or a farm, there are many universal investing principles. There are always two basic types of investment: investments that produce and investments that don’t. That’s it. And that covers any investment I can think of. 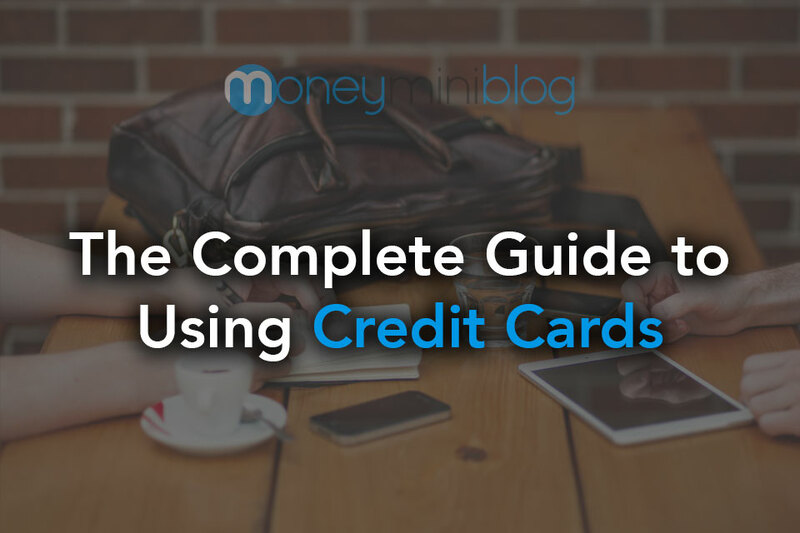 The terms may change, but in the end, you’ll be earning money in one of the above three ways. The stock market gives you the opportunity to use one or all of these ways to make money, and so do plenty of other investment opportunities. According to Buffett, what an investment produces is much more valuable than what the investment itself is actually worth. This idea is easily explained in the stock market by looking at dividend stocks, but how do other types of investments “produce?” Investments can produce in several ways; a farm produces a crop or meat or dairy or something along those lines. Real estate can produce cashflow through rental income. There are all kinds of ways investments produce. It’s funny how these ideas that are often thought of as “stock market investing tips” can span asset classes. I highly suggest diversifying your portfolio to include some of the following. You don’t need everything here, but I recommended at least trying a couple. If you’re investing outside of the stock market because you’re afraid the market or the US dollar is going to collapse, I have bad news. If the dollar or the stock market collapses, it’s going to affect other investments. It would affect everything. In the world. Note: If you’re truly worried about the dollar collapsing, I suggest investing in skills and friends. Skills will always be valuable, even if the world economy collapses. If something catastrophic happened, you would want to know how to do things that people will pay you for and you would want people on your side. However, my advice is that worrying helps nothing. 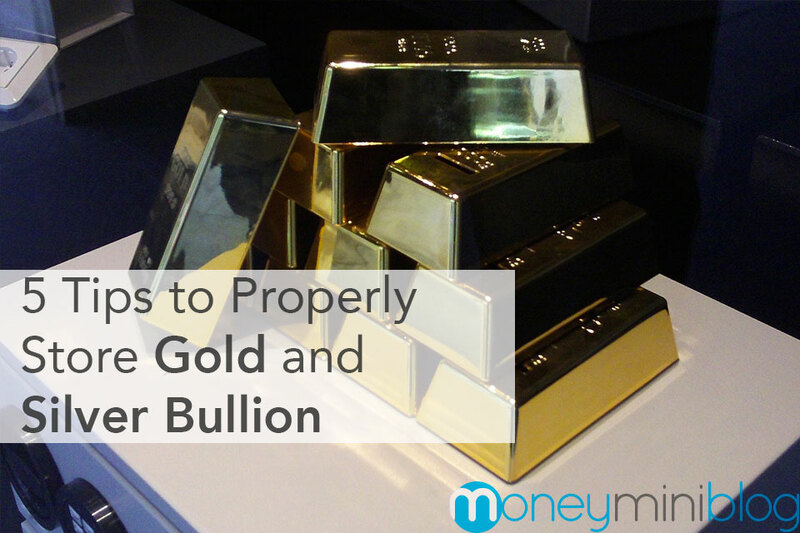 Hard Assets – Commodities like gold and silver are the old “go-to” alternate investment options. The only problem with these is that they don’t produce; the hope is that the value increases, but it doesn’t always. It’s good to have some hard assets, but I personally wouldn’t go as far as backing a 401(k) with them. Inventions – Angel investing is the main way to find good invention ideas, or just talk to people you know. You might only be a couple degrees of separation from an inventor who’s looking for investors. When you hear of a good Kickstarter fund for an invention, contact the inventors and ask them if they have investment opportunities. Real Estate – It will always be worth something. Everyone has to live somewhere. You can invest in rental properties that will produce an income, or you can buy raw land in hopes that it will increase in value. Just keep an eye on your taxes and make sure to pay them. Commercial real estate is another option, but do your research first! Small Business – It’s true that most small businesses end up failing, but if you really know of a groundbreaking local business, it’s worth a shot. You know the local market better than outsiders; use that to your advantage. If you think you’ve found the next Apple, you could be in for some big returns …of course you could also lose everything you invest. Greater rewards come through greater risks. Peer-to-Peer Lending – You can loan money to your brother-in-law and tell him to pay it back with interest. However, that may be the last time you ever see your money or your brother-in-law. Fortunately, there are ways to take advantage of peer-to-peer lending with less risk. Lending Club and Prosper are two of the most popular options, and the offer quite a bit of protection. Similar to the protection of a mutual fund, they will spread your investment across many different peers, so you’re not lending your money to one person. Collectibles – Sports cards, stamps, model cars …almost anything is collectible if you can find a buyer and you can keep it in mint condition. This is more of a hobby than anything so you want to be sure you’re interested in whatever you’re collecting. But remember, for collectibles, without a buyer, it doesn’t matter what it’s “worth.” Use that to your benefit when you’re buying collectibles, and you will have an easier time selling them down the road. Often, due to how long it takes for some collectibles to become valuable, consider leaving this as a legacy to your children, possibly even for their children. Antiques/Art – Similar to other collectibles, antiques and art are only worth what someone will pay. That being said, there is a large market for both of these things. The most important thing here is to do your research. A well-researched buy can outperform the stock market any day. An uninformed buy can be the biggest burden in your portfolio. Wine Bottles – It’s actually possible to make between 6% and 15% annually by investing in wine. You need to know a lot about wine, such as which wines are worth the most, how to store it properly and where to buy it, but this investment can definitely pay off. Of course, you need to make sure you’re not going to be tempted to drink it all. Farming – This can go one of two ways. It can either be a lifestyle investment by buying and working a farm yourself, or it can be a capital-only investment by owning a farm that is run by someone else. 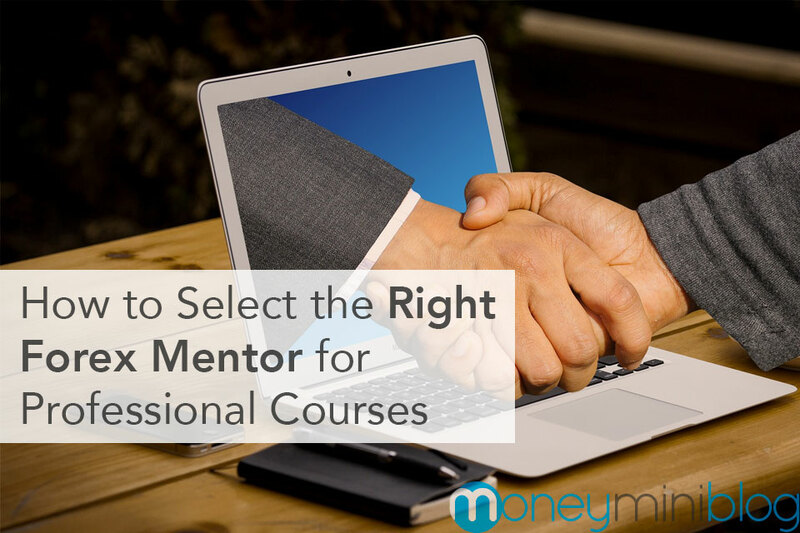 Of course, you’ll usually have to go in and get the process started yourself, but it can be a profitable investment once it’s up and running. Remember, this is one of the alternate investment options Warren Buffett uses. These aren’t your only options. Of course, you can always put your money in “high-yield” savings accounts or “invest” in CD (Certificate of Depression Deposit) ladders, but the rates of return are so low, it’s not much of an investment. If you’re just looking to get out of the US stock market, there are plenty of stable foreign stock exchanges. The terms can be the most intimidating part of investing. If you’re new to it, it can seem like a new language. In some ways it is, but you don’t have to know everything. There are really only a few terms that you need to understand to get started. I’ve included the following list of some common terms associated with investing. While it’s unlikely that you will ned to know what each one of these mean, you will need to know more about a few. You have heard the term 401(k) before. You know it has to do with retirement. You may even contribute to a 401(k), but do you fully understand it? It’s simple to understand what it is and how it can help you. A 401(k) is a company retirement plan. Think of it like an IRA that is affiliated with your company. An IRA is individual and private, whereas a 401(k) is through a company. Similar to an IRA, you (usually) have the option to invest in a Traditional 401(k) or a Roth 401(k). A traditional 401(k) lets you contribute pre-tax dollars, but you will be taxed on the capital gains you earn. A Roth IRA lets you contribute post-taxed dollars, but you pay no tax on your capital gains. The investment options will vary, depending on the retirement account provider, but you will usually be able to pick from a range of index funds and mutual funds. With some companies you may even have more options, to include individual stocks and bonds. Many companies will match what you put into a 401(k), up to a certain percentage. Different companies match different amounts, but if they match at all, it’s free money. You may also want to contribute to your 401(k) in addition to an IRA since the contribution limit for a 401(k) is much higher ($18,000 compared to $5,500 for an IRA – as of 2017). Remember: 18,000 is the maximum amount you can personally contribute, your total contributions can be higher if your company matches. The total contribution limit, including company match, is $54,000 for the year 2017. However, if your company doesn’t offer a match and you aren’t able to contribute more than the limit for an IRA, I would suggest just sticking with your IRA since it will have more investment options. You can also “catch up”, like you can with an IRA. Individuals over 50 can contribute an additional $6,000 per year to their 401(k) in order to help them reach their retirement goals. A 403(b) is basically the 401(k) for organizations. 403(b) plans are only offered to public education organizations, 501(c)(3) organizations, some hospitals and self-employed ministers. A Thrift Savings Plan (TSP) is offered to Federal employees, such as the military. Some Federal employees are offered a match and some aren’t. It depends on your position with the government. The contribution limits and figures for 403(b) and TSP plans are the same as a 401(k). A SEP IRA is a similar retirement account, but it is fully funded by the employer. A Simple IRA is a company retirement plan for companies with less than 101 employees. Contribution limits and other figures can change over the years. These numbers are current as of 2017. Get the current numbers here. I hope you feel a little more comfortable about 401(k) plans. So, what should you do now? Figure out if your company has one of these plans. Contribute to your company plan if they offer a match. Contribute the maximum amount that your company will match. If your company doesn’t match, only contribute after you have maxed out your IRA. If you don’t understand something, ask questions in the comments. Do you save for your children’s education? Or do you plan to start? If you think it’s important to help your child with college expenses, you are in luck, because you have some options. One of the most common ways to save for education is through a 529 plan. A 529 is like an IRA for education. A 529 is an education savings plan. The name is taken from Section 529 of the Internal Revenue Code. Note: There are technically two types of 529 plans. The one we will be discussing here is the account that you use to save for future education expenses. There is also an option for pre-paying tuition to a specific school or institution. This second type of 529 plan is much more restrictive and less common. Like an IRA, a 529 is not an investment in itself, it’s a tax shelter for an investment. The difference is that an IRA is tax-shelter when used for retirement, but a 529 plan is a tax-shelter when used for your children’s education expenses. You are generally given multiple investment choices, including mutual funds and/or index funds. There are aggressive investing options for when your children are young. Then there are much more conservative options for when your children begin to approach the college age. You can choose a 529 from any state that offers a 529 plan. Again, there are no laws or requirements to be a resident of the state in which you open a 529 plan. You can live in Arkansas, open a plan in Oklahoma and go to school in California. There are multiple benefits to opening a 529 fund for your children. Anyone can open one since there are no income restrictions. If the money is used for education, you will pay no federal taxes on earnings. So your money grows tax tax-free, when used for school. Unlike Education Savings Accounts (ESAs), your child doesn’t have control over the money once they reach a certain age. You will always remain in control of the money. Another great thing is that most states don’t have an age limit for using the money. Let’s recap…a 529 plan is a fund that allows you to grow tax-free earnings as long as you use the money for school. 529 plans are fairly lenient when it comes to what is considered an education expense. Pretty much anything that you would use to study or do school work. What if my children get scholarships or grants? If your child doesn’t end up needing the money due to scholarships or grants, you can use the 529 plan to buy other education related expenses or you can roll the money over into a 529 for another child. What if my child doesn’t decide to go to college? If your child doesn’t go to college at all, you can roll the money over into a 529 plan for another child or you can pull your money out and not use it for education. What happens if I don’t use the money for education? You pay a 10% penalty, as well as taxes on any earnings you receive…similar to an IRA. However, you don’t pay taxes on the money you contributed since it was pre-taxed money (taxes were taken out of the money when you earned it). Where can I open a 529 plan? TD Ameritrade is a great place to open a 529. Learn about the specifics of their 529 here . Most other investment companies offer 529 plans as well. How much can I contribute to a 529 each year? The maximum contribution limits change depending on the state, but it’s usually at least $100,000…sometimes as much as $200,000. Bitcoin is a new term compared to most other forms of currency. Bitcoin is now a real and fairly popular currency, so you should probably know a little bit about it. It’s important to note, before I continue, that Bitcoin (capital ‘B’) is a system and one “unit” of this type of currency is referred to as a bitcoin (lower-case ‘b’). So there is Bitcoin and there are bitcoins. While bitcoins may not appeal to the “general public”, they are extremely appealing to a number of people. Bitcoins can be used to make anonymous purchases, which makes them very attractive to certain individuals. They have attracted a crowd of investors as the cost of bitcoins keeps increasing and there are also no fees associated with them during the transaction process. In short: you buy them, trade for them or “mine” them. There are several bitcoin exchanges online to buy and sell. You can transfer bitcoins online, similar to how you would transfer cash with a computer or a smart phone. This is how bitcoins are originally created, through a process called “mining”. Once purchased or mined, bitcoins are stored in a digital wallet, where you can send, receive, spend and save them. Bitcoins are not insured by the FDIC. They are not backed by any physical asset, so they have no intrinsic or physical value (similar to the US dollar?). Overall, it’s your call whether you want to get into this market. There are many risks associated with bitcoins that you should be aware of. Bitcoins can be stolen if someone hacks into your computer (they are working to make them more secure). If your computer crashes without a backup, bitcoins can be lost. Basically, most of the standard risks associated with computer files also apply to bitcoins. There are also positives, such as not having to go through a bank and not having a limit on how many bitcoins can be created. The latter could be a downfall as well, if you look at it through the lens of inflation. The moral of the story is that, like any investment, you should be wise and do your research. Any investment can lose value and bitcoins are no different. Furthermore, since bitcoins are a new currency, they should probably be considered a high-risk investment. A bond is a form of investment. Simply put, a bond is debt. When you buy a bond you are basically offering a loan to a company or government, and the entity that you borrow from is then in debt to you; unlike a stock where you own a share (or a piece) of a company, with a bond you are just loaning the money for a certain amount of time. This definition is for the investor wanting to know what a bond is (for investing purposes not macro economical purposes) so I won’t get too deep into monetizing, but I will say that bonds are often what people are referring to when they talk about the government printing more money out of thin air. This occurs through selling bonds to the public, as well as the government buying their own bonds (monetizing). Bonds usually offer a considerably safe return, which is why the return is generally much less than stocks, but this is not to say that there are never risks with them. With any investment comes some form of risk. The company or government offer a fixed interest rate that they will pay you over a certain period of time (usually paid out every 6 months). The interest rate is generally higher for longer term bonds, because the longer you let them keep your money, the more they are willing to pay you for it. The interest rate also usually depends on the credit rating of the issuer. Example: a company with a low credit rating may offer a high interest rate on your money since they are less likely to actually pay out. These are often referred to ask junk bonds, which can be very risky, but also very rewarding. Generally the safest assumed bonds are issued by the United States in the form of Treasuries. It is also generally believed to be fairly safe to buy them from large-cap corporations such as the companies in the Dow Jones. There are many types of bonds and many people believe that a certain amount of your portfolio should consist of some form of bonds, but make sure to do your research on the types before you dive into buying them. Purchasing bonds can be a similar process to purchasing stocks and mutual funds; in fact, you can actually purchase bond funds or you can purchase them individually. You can purchase bonds through a broker or through an online brokerage account, similar to how you would purchase stocks. You also have the option to purchase government bonds directly from the government or the city through scheduled auctions. TD Ameritrade is a great options for buying bonds. A DRIP (Dividend Reinvestment Plan) is great for the small investor. If you personally want to invest, but feel like you don’t have enough money, a DRIP is a great starting place for you. You don’t need very much money to get started and you don’t have to keep pouring large amounts of money in. A DRIP is a company program for it’s shareholders (anyone who holds stock or wants to hold stock in the company). It’s a clever name, because the investment process works in a dripping nature. You can start a DRIP by buying one stock of a company. Your dividends are automatically reinvested, which is how your money continues to drip into the account and create wealth over the long term. A DRIP can also allow you to buy fractions of shares, since the dividends usually wouldn’t be enough to buy whole shares every month. Let’s say you own one stock and the stock price is $50 with a dividend of $1 per share. You would buy 1/50th of a share every time you are paid a dividend and your money is reinvested. DRIPs are meant to be a long term, “buy and hold” investment. Usually you will not be charged commissions or fees when you reinvest the dividends since you are working directly with the company. The best part is that most of the time you can even buy more shares without paying commissions or fees. That’s good news! You can continue to purchase shares through automatic purchasing plans that can be setup with the company. You’ve got to love automated investing! The share you purchase and the dividends you reinvest will begin to add up quickly, even if you started with a very small amount. If you don’t have much to start with, this is one of your best options. To start a DRIP, contact the shareholder relations division of the company you are interested in and ask them if they have a Dividend Reinvestment Plan. If they have the plan, they should get you started right away. They also have the prospectus, which is basically shareholder information for you to learn more about the company and your investment. Most large companies (such as McDonald’s, Coca-Cola and AT&T) offer this plan. Contact them directly to find out. An ETF (Exchange-Traded Fund) is a fairly new invention and they are getting very popular. An ETF is similar to an index fund. It tracks a particular index like an index fund, but it is traded like a stock. This means that an ETF has a ticker symbol and you can buy it by the share. Exchange Traded Funds can also track commodities such as gold and silver. This is a great way to invest in commodities with small investment amounts without holding physical assets. They also give you more liquidity than holding physical commodities. Most index funds have minimum amounts for investment (such as $500, $1000 or even $3000+), but ETFs do not. This is really great for people who cannot afford to start with the high minimum initial investments of index funds. The expense ratio will usually be much lower for ETFs than index funds or mutual funds. When you purchase ETFs, you pay the usual commission that you would pay when you buy a stock or a bond. You can purchase ETFs just like you would purchase stocks, through a broker or through an online brokerage account. They have ticker symbols just like stocks. For example, SPY is the ticker symbol of one of the most popular S&P 500 ETFs. ETFs are a great way to invest in a certain industry if you don’t know which specific companies to invest in. Open an IRA in 15 minutes or less with TD Ameritrade, where you can buy stocks, mutual funds, index funds and ETFs. An index fund is a fund that tracks an index, such as the S&P 500, the Nasdaq 100 or the Dow Jones (the 3 most popular American indexes). So what exactly is an index? An index is a representation of a portion of the stock market. Example: The Dow Jones Index is comprised of 30 companies, these are 30 of the largest and most influential companies in America. So if you were to invest in a Dow Jones index fund, you would be able to invest in a single fund, but that single fund would be invested in all of the companies on the Dow Jones Index. There are larger indexes, the largest among popular indexes probably being the Russell 3000 Index, which includes 3000 companies (as you may have guessed). Some believe that Russell 3000 index funds may be the best way to invest in the stock market as a whole and they are probably accurate, since it contains so many companies. There are so many options for index funds, that I can’t name them all in a mini blog, but here is a list of the major global indexes. The most popular index as far as owning an index fund goes, is probably the S&P 500. This index includes basically all of the companies on the Dow Jones plus another 470 companies like Apple Inc. and Google Inc., to name a couple of the most popular right now. Index fund fees are generally much lower than the fees of actively-managed funds. An index fund is passively-managed, so the manager does not have to “manage” it by picking the stocks based on research and there are generally little advertising and marketing fees for index funds. The average fee for an index fund is around 0.3%, which is generally more than 1 percentage point less than an actively-managed fund. Many company retirement plans, such as a 401(k) or a 403(b) have index funds as an option for investment. The US Armed Forces, as well as many other government positions, have the option to invest in a TSP (Thrift Savings Plan), which gives you several index funds to choose from. You can also invest in an index fund through a brokerage company or financial institution in an IRA or a regular taxable account. Index funds are a great core for your retirement investing and they can also be used to save for big ticket items, as long as you can devote several years (generally five or more) to the investment. The stock market can be scary for new investors, but it’s not quite as complex as the folks on Wall Street want to pretend it is. This brings us to the most basic question about the stock market: What is a stock? A stock is a share of a public company. There a private companies and there are public companies. Private companies are owned by individuals or by other companies. Public companies are owned by, you guessed it, the public! This is a way to have multiple people contribute to a company financially. Let’s say a company is just starting out and they need $100,000 to get started. They could raise the money on their own or they could go public. Let’s say the go public. Since they need $100,000, they start their stock price off at $100/share and offer 1,000 shares (100 x 1,000 = 100,000). Now if all of these 1,000 shares sell, the company will be fully funded and have their $100,000. Once this company begins to earn profits, the profits could then be divided among the share holders. If they managed to make $100,000 profit in the first year, they could add $100 to the price of each share. Now all of the people that owned shares worth $100/each would own shares worth $200/each. That’s a nice profit! The company would also have the option of using that profit to re-invest in the company, pay dividends to shareholders or repurchase their own stock. Repurchasing stock is where a company reduces the amount of shares by buying their own stock to destroy it, which decreases the total number of shares and that increases the value of the rest of the shares. People used to have to go through an actual broker to buy any stock. 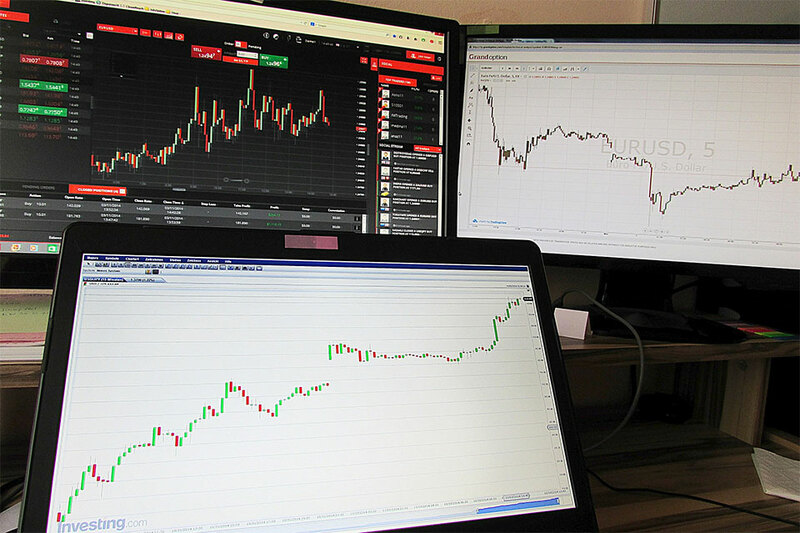 They would call to place an order and it was a rather long process, but now it is easy to buy stocks online, by yourself. There many great companies like TD Ameritrade or USAA (my personal choice if you have military affiliation). Buying a stock is as simple as figuring out the stock ticker symbols (i.e. Walmart’s symbol is WMT) and placing an order for the amount of shares you want. Generally you will have a money market account in your brokerage account to store the money that you use for purchasing stock, in other words, you generally buy stock with money from your brokerage account, not with your regular checking account or a credit card. It often takes 5-7 business days to have the money available to buy stock once you transfer it to your brokerage account. First off, an IRA (Individual Retirement Arrangement) is NOT an investment. An IRA is a shelter for investments. A tax shelter. In an IRA, you have the options to buy stocks, bonds, mutual funds, money market accounts, CDs and, in some cases, real estate. The purpose of using an IRA as an investment account to hold all of these securities is simple; the tax breaks. However, you are responsible for a 10% fee when you don’t follow the rules. The main rule to know is that, in typical circumstances, you should not begin pulling money out of an IRA until your are at least 59 1/2; otherwise, you could be hit with penalties and fees for the withdraw. Note: You will not incur fees or penalties for withdrawing money that you put into an IRA, you will only incur fees or penalties from your earnings. There are 2 common types of IRAs: a Traditional IRA and a Roth Ira. What’s the difference? Basically there is one main difference. Traditional IRAs allow you to contribute pre-tax income. This means that you can put money in a Traditional IRA before Uncle Sam has the chance to touch it. With a Roth IRA, you contribute taxed income. Here’s the catch: when you go to withdraw your money, in retirement, the withdrawals from a Traditional IRA are taxed and the withdrawals from a Roth IRA are tax free (since you already paid tax on the money you put in). So in a Roth IRA, you do not pay taxes on the capital gains you earn over the life of the account. The choice seems obvious, right? If you know anything about compound interest, then you know a Roth IRA would save you a lot more tax dollars than a Traditional IRA, because you will generally make way more money, through capital gains, than you would contribute. Well, unfortunately, the government knows that too, so they put certain restrictions on Roth IRAs. Example: if your income is too high ($191,000/year as of 2014), then you can’t contribute to a Roth IRA at all. You can still contribute to a Traditional IRA, no matter how high your income, but the tax benefits decrease as your income increase. You can “catch-up” on your investing into an IRA, if you are 50 or older, because you are allowed to invest an additional $1000 on top of the regular annual limit. What annual limit, you say? There is a maximum annual contribution limit, in both types of IRAs, of $5500 (as of 2014). This amount increases periodically, but many people believe it may be at $5500 for a while. You can open them at most financial institutions. This includes banks, investment companies and many website. Watch out though, because some banks limit the types of investments that you can put in your IRA. Personally, I use USAA, but you do need to have military affiliation to use them. USAA is an amazing company. I like their customer service and the ease of opening accounts with them. Did you know that Roth IRAs aren’t just for retirement? IRAs are great for retirement accounts, but that’s that all! There are many little-known uses for an IRA to shelter money from taxes. That’s right! You can use an IRA as an education investment account to pay for college. This not only includes your own college, but also your spouse and any of your children. The downside is that IRA distributions are considered income on financial aid applications, so this may affect the amount of financial aid you receive. Depending on your situation, you may benefit more from an IRA as a savings account or a 529 may be better for you. If you qualify as a first time homebuyer, meaning you have not owned a home in the past 2 years, then you are eligible to take up to $10,000 out of an IRA for a down payment on a house without paying the 10% fee. This applies to buying, building and re-building a home. You can use an IRA to cover unreimbursed medical expenses, if the total medical expense exceeds 7.5% of your adjusted gross income. With estate-planning comes another great use for an IRA. If you contribute to a Roth IRA and you name your children and/or grandchildren as the beneficiaries, you pass that money to them and they are able to pull the money out, tax-free. If you become disabled and unable to work, you can draw income from your IRA as long as you provide documentation of the disability. If you are able to receive Social Security disability then this would be extra money on top of that. Overall an IRA has a vast amount of uses, but if you are caught in an emergency, an IRA should be your last resort. It should also be noted that these are different ways of using an IRA, but you should only take advantage of these if that is your initial purpose in investing in the IRA. Simply put: it shouldn’t be a last minute decision to pull a down payment for your home out of your retirement money. All of the usual rules apply when using money for these purposes. A Traditional IRA would still be hit with an income tax on the money you pull out and a Roth IRA would be tax-free income. Open an IRA in 15 minutes or less with TD Ameritrade. A mutual fund is like a bucket full of multiple different stocks, bonds, securities or a combination that you invest in collectively. When you buy into a mutual fund, you are buying into all of the securities in the fund by making one single investment. It is a great way for instant diversification. There are stock funds, sector funds, passively-managed, actively-managed, load, no-load, money market funds, balanced funds and that’s just naming a few of them. This may seem confusing, but if this seems more complicated than you would prefer, there is a simple rule that you can live by: Invest in index funds. It really is that simple. Historically, index funds have outperformed 80% of mutual funds. There are always fees associated with mutual funds, but they vary drastically. There are management fees and 12b-1 fees; the 12b-1 fees are charged by some funds to cover some of the overall costs of the fund. Load funds charge an upfront or a back-end load fee, which is just a sales charge that you either pay when you buy in (upfront) or when you sell the fund (back-end). No-load funds, however, do not have either of those fees. Index funds tend to have the lowest fees of any of these funds, but if you do decide that you are going to try to beat the market and invest in one of the funds in the 20% that do outperform index funds, then the fees usually won’t matter as much to you. Many times the funds with loads and higher fees are the funds that promise or at least attempt to beat the market, just make sure all of the high fees don’t outweigh the increased earnings. There are many ways to invest in all kinds of mutual funds and index funds. You can generally invest through a brokerage company or a financial institution. USAA, for example, offers there own mutual funds and index funds, but you can also invest in other funds through a USAA brokerage account. If you decide to invest in any fund, you should head over to morningstar.com to get performance information on any fund you choose. Many people choose funds based on past performance, which is a fairly reliable method to use, but if you are investing in index funds, it’s more about picking the right index to invest in, than the specific fund itself. You have probably heard a lot about penny stocks. I’m sure you have seen ads all over the Internet that advertise things like “Get rich with penny stocks!” or “Turn pennies into thousands!”. Well unfortunately those ads aren’t very realistic. I know, I know, it’s surprising to find something on the Internet that may not be true. Is it possible to make a lot of money with penny stocks? Sure. You can make money with anything if you are good at it or lucky, but it’s definitely not for everyone and it’s not really investing. So what exactly is a penny stock? Penny stocks are basically any stock that trades for less than $5 per share. The $5 things is new, since a penny stock used to be any stock trading for less than $1 per share, but the definition was recently changed by the Securities and Exchange Commission (SEC) to include any stock under $5. So contrary to popular belief, the value doesn’t actually have to be in the pennies to be considered a “penny stock”. I guess they figured dime stocks and quarter stocks sounded ridiculous and now it’s easier to say penny stocks as an all-inclusive term for these risky stocks. There is a stock even cheaper than a penny stock, known as a sub-penny stock. This is, as it sounds, any stock that trades for less than one penny per share. Some sub-penny stocks can go pretty low. It’s not uncommon for them to trade at .001 cents per share and even lower. Most of these sub-penny stocks (and many penny stocks) trade on the OTC (Over-the-Counter) markets and they are extremely speculative. It is possible that they aren’t even a company. Some are just plain scams. It may seem strange that stocks worth up to $5 can be called penny stocks, but there is a reason for this. These low valued stocks of $2 or $3 are perceived to be just as risky as the stocks that are worth less than $1; therefore, the name penny stock applies to all of these now. Basically, when you hear penny stock, most people think high-risk. So now the other high-risk stocks are included. The chance for losing money with penny stocks is much higher than gaining money. With penny stocks, there are usually thousands of people buying and selling thousands of shares all the time, which makes for a very up and down stock price. It’s not uncommon for a penny stock to increase or decrease by 500% (or more) in one day, merely due to trading activity (and that is not the primary reason you want to see a stock price change). If you want to get into penny stocks, you can buy some for a few bucks, just for fun, or you can find some of those Internet programs that promise to help you make money with penny stocks, but I wouldn’t recommend that. Just remember, it’s much more like gambling than investing. Even if you do earn money, that doesn’t mean it was a wise decision. You don’t need 1000 tools to start investing, but you do need a few. Some make investing possible, like brokerage companies and banks. Others just make investing easier like resources and apps. TD Ameritrade is a great place to get started investing. You can open an IRA for retirement, a 529 for your children’s education, a standard brokerage account to buy stocks, or start a number of other investments. They offer some of the lowest fees and best customer service for beginners. USAA is my absolute favor place for banking, investing and even insurance. However you must have a military affiliation (personally or family member) to use them. You can click here to see if your military affiliation qualifies you. They make it easy to open every type of investment, and they offer some great mutual funds and index funds. Betterment offers automatic investing options and low fees. It’s easy to set up your retirement plan and to keep contributing to it automatically. They will automatically invest your money based on your desired risk level and stage of life. It’s worth it to have someone else you can trust to handle everything. Your finance headquarters. 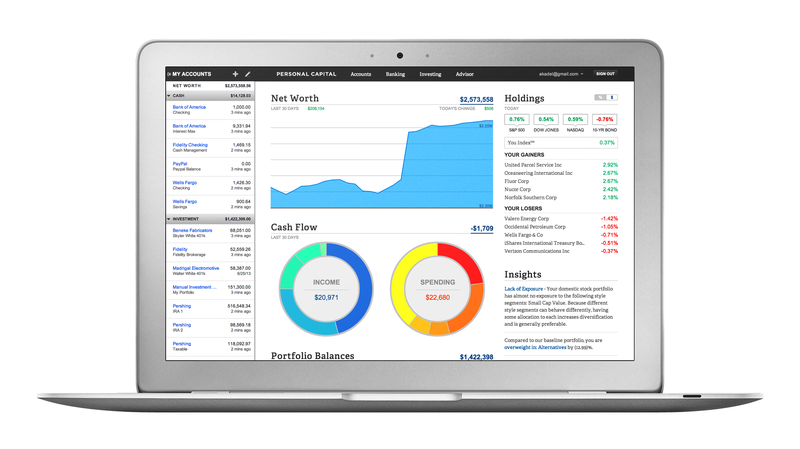 Link your accounts, track every transaction, see your net worth and more. And it’s completely free. See your up-to-date net worth at any time. See your transactions from all cards and accounts in one place. Check for fees and make sure you’re making the best investments. 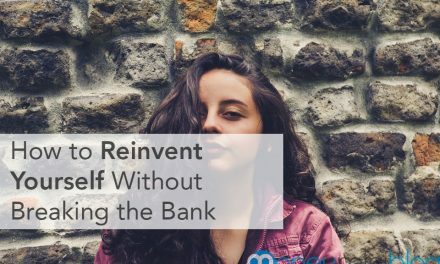 You can use Personal Capital on your phone, tablet or computer. It’s my favorite tool for tracking all of my spending. You can link your accounts, and it’s totally safe. They have the same security measures as online banking websites. Since they make their money from their investment advisory services, using Personal Capital is 100% free! Cash back that helps you reach your goals. 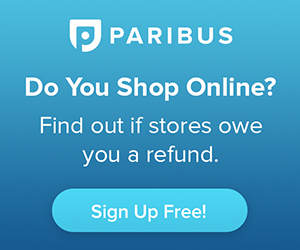 Earn cash back and use it towards your retirement, student loan debt or a college fund. Great information on individual stocks. A screener for value stocks, based on Benjamin Graham and Warren Buffett’s method. Financial reports for companies all in one place. These are my top 3 all-time favorite books on investing. I feel like they lay a great foundation for beginners and experienced investors. 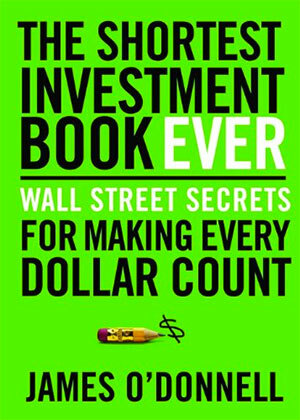 You can read this book in a couple days or less, and it will explain most of what you need to know about investing. 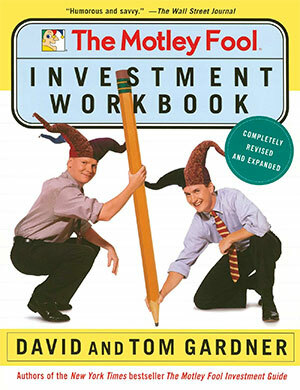 This workbook taught me more about investing than any other book, since you actually work through the process. Joel lays out a “Magic Formula” that can actually beat the market, if you’re willing to put in the work. I just want to say thank you! I appreciate you reading my guide. I put a lot of work into this, and I truly hope it benefits you. If you have any questions about anything, please reach out to me.